What will Oakland do with their plans for Pot Farms, now that Prop 19 barely/almost made it? Even though just a little more than half of the California voters voted against Prop 19, Oakland will resume its plan of taking marijuana out of the ‘taboo’ market. In it’s City Council meeting, Oakland officials have decided to ratify the application process of these soon to be government-sanctioned ‘amazing’ pot farms. In the same measure, Oakland is also allowing for a doubling in medical marijuana despensaries. Some of the changes that they are making to the application process is that it requires applicants to undergo farming licenses requirements, background checks, and that they have the money to do what they are doing (financially backed). Industrial Marijuana Farms? First in Oakland, CA. San Francisco Chronicle July 20, 2010 11:40 PM Copyright San Francisco Chronicle. All rights reserved. This material may not be published, broadcast, rewritten or redistributed. (07-20) 23:40 PDT OAKLAND — Oakland’s City Council late Tuesday adopted regulations permitting industrial-scale marijuana farms, a plan that some small farmers argued would squeeze them out of the industry they helped to build. To address concerns from smaller farmers, the council pledged to create regulations on regulating small- and medium-size marijuana farms this year. Council members and proponents of marijuana cultivation regulation viewed the proposal as smart public policy: It would generate revenue, ensure that fire and building codes are enforced, keep neighborhoods safe from robberies, and further position Oakland as the center of the state’s cannabis economy. “It’s really important for Oakland to be a vital part of that growth and development for licensed facilities,” said Councilwoman Rebecca Kaplan. But many of the folks on the front lines of the young industry say it will change the culture of what they’ve built. They say industrial farms will turn a grassroots economy into a corporate one, driving down costs but also eroding the quality of the marijuana, which state voters defined in 1996 as medicine. The most influential critic was Steve DeAngelo, owner of Oakland’s Harborside Health Center, the largest medical marijuana dispensary in the nation. His dispensary buys from some 500 different growers, meaning Harborside offers about 100 varieties at any time. Permitting only industrial operations would reduce variety, he said. “Government should not choose the winners and losers but create a level playing field,” he said. “Some people might prefer mass production, assembly-line cannabis that costs less. Others might prefer cannabis grown by a master gardener in a smaller plot. “Let the market sort it out,” he said. The regulations will award permits to four indoor marijuana farms. 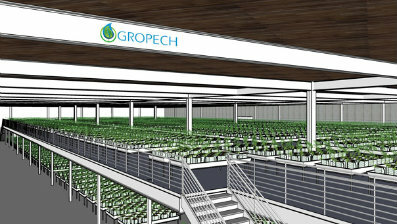 There will be no size limit, but there have been proposals for farms as large as 100,000 square feet – about the size of two football fields. DeAngelo said he would prefer farms of various sizes. The regulations will require applicants to have a minimum of $3 million worth of insurance, hire security and pay a $211,000 annual permit fee. The city will be begin to issue permits in January and will allow the industrial farms to sell only to medical cannabis dispensaries. But if state voters pass Prop. 19, a November initiative that would legalize recreational use of marijuana, proponents believe the city would be well situated for the booming industry. By regulating certain growers, Oakland also plans to crack down on illegal grows, said Arturo Sanchez, an assistant to the city administrator. His comments immediately prompted hissing and booing in the crowd. Oakland has long been pushing the boundaries of marijuana legalization. In 2004, voters passed Measure Z, declaring marijuana a low concern for law enforcement. In 2009, voters passed Measure F to tax medical cannabis at 1.8 percent. The taxation, believed to be the first of its kind in the nation, was a step toward legalization. FIRST OF ALL: GO OAKLAND! I know that there are going to be all sorts of unplanned reprocutions for this, but wow. So, as I go into my thoughts on this, please know that I am just expressing my feelings on the subject, and that if you are interested in anything that I mention, you can contact me at my personal e-mail address at Hogwartshighinquisitor@gmail.com. All right, to begin, this is a great measure for the culture of marijuana. I know that there are some huge concerns out there, the biggest being, “What happens to the smaller growers/sellers?” Without going into that specific topic with too much detail, the legislation is apparently being written to include regulation to benefit the smaller businesses. But think about what this is going to do for the American/worldly culture of marijuana? This is going to be such a big deal, and California is on the ballot currently to allow the legal sale and distribution of marijuana with Prop 19 this November. This is not to mention the fact that there will be hundreds of thousands of jobs created by the California government, and private companies looking to expand in the industry, just by allowing it to happen. Adults over the age of 21 will be able to buy from an approved seller, and will be enjoying/relaxing the rest of their night or weekend after probably being overworked and underpaid from their jobs. I think the biggest problem here is that people just need to get over themselves. If you are against this, then chances are you probably haven’t smoked due to your personal lifestyle choices, which is great! However, I should be able to LEGALLY make my own damn decision about this, as the last time I checked, I am an independent adult, over the necessary age to make any other legal decision about what to put in my body (hmmm, will it be chemical shampoo and conditioner that will stay in my hair most likely for the rest of my life, or maybe even more intoxicating/horrible for your body alcohol.